June has become the month of Part-Ays! Fun fun fun and presents needed. Having little incoming cash my plan is to make as many gifts as possible (which reminds me I need to get back to that cross stitch I’m doing … STAT). Something came up that required me to make a fancy wine glass for one of these occasions which opened the flood gates for everyone to receive designer glassware! Nothing I have made so far has turned out the way it was supposed to … or at least the way I saw it in my head. 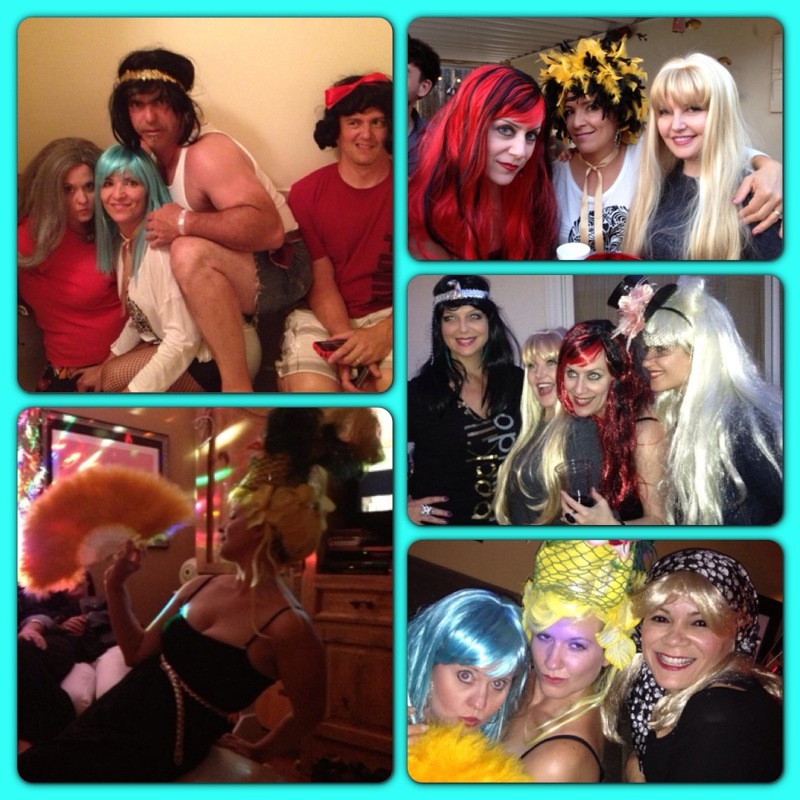 My friend Dee Dee had her birthday party last weekend. 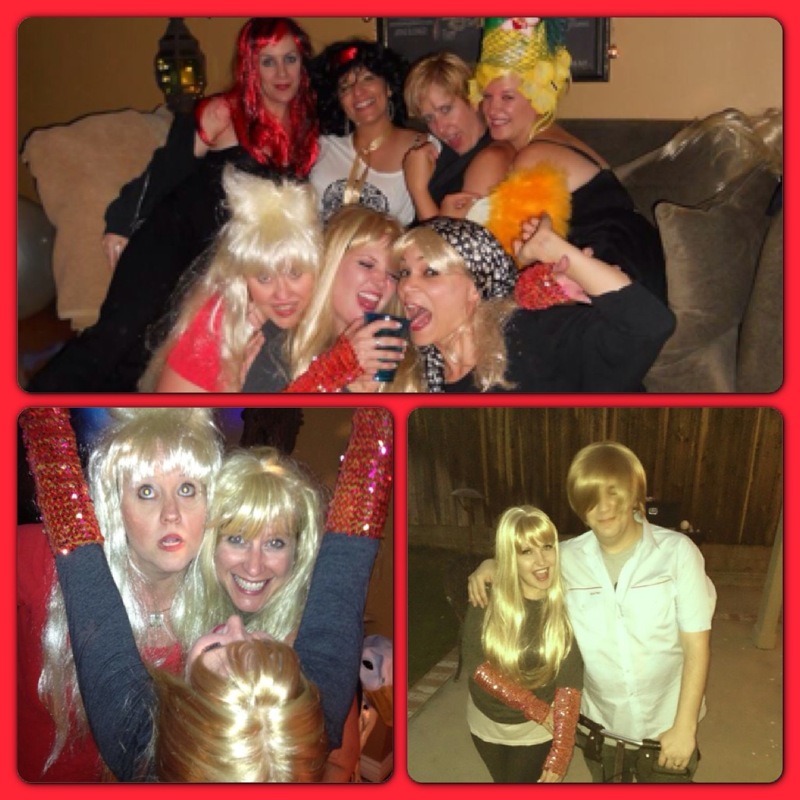 It was a wig themed party because wigs are fun. 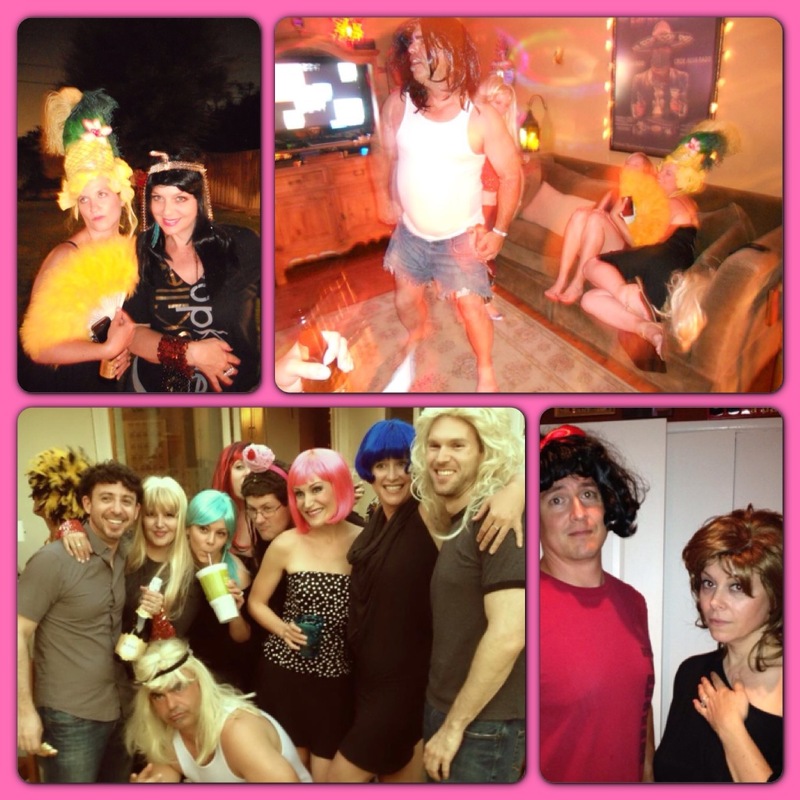 When my friends heard the theme there was no groaning about having to wear something silly on their head instead it was a chorus of “when and where!” I’ve included just a small sampling of pictures from that night. There are a zillion more and I’m afraid my sampling doesn’t include all the guests but you get the point. It was a fun evening. Back to the gift. First I made a cork hot plate. Super easy. Find a frame that works for you. My frame size was determined by the number of corks I had available. 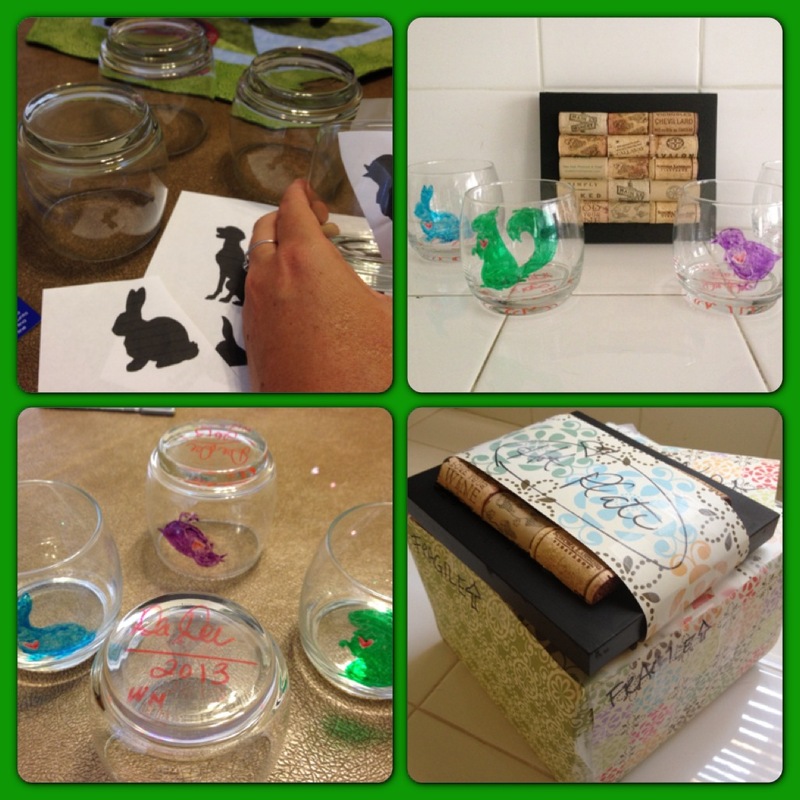 Get some mighty powerful glue and glue down the corks … TADA! Couldn’t be easier … except I put a large art book on top to hold the corks down while the glue dried and chunks of super strength glue came spilling out the sides. I tried to pick off as much as I could with a knife and then gave up. My solution? Paint. I grabbed some black paint and went around the top of the frame (actually it’s the bottom because the corks fit better there). It doesn’t look bad. I was happy with it. Then on to the glasses. I didn’t want anything too complicated so decided animal silhouettes where my best bet. After hours of internet searches I settled on the four I wanted and printed them out. I cut out each and taped it to the inside of the glass so I could easily trace and then fill in with my glass paint pens. Those paint pens are tough to work with. First of all they dry pretty fast and you can’t really go back over anything (more about that when I post another craft gift in the future). So you gotta like what you did the first time! Secondly they aren’t exactly easy to draw with and even harder to keep the paint even throughout your design. After I finished my talented drawings I stuck them in the oven for 40 minutes (once the oven is up to temperature. I don’t remember what that temperature is but it’s on the glass paint pen instructions). Of course glass can shatter in extreme heat to cold and visa versa so you gotta put the glasses into a cold oven so they warm slowly. Then when the time is up open the oven door and let everything cool. Be sure to keep all dogs out of the kitchen during cool down time as they are drawn to ovens, especially those that may have cooked on pizza goop at the bottom of them, and the last thing you need is a dog nose on hot glass. That’s it. That’s all there is too it. I made a bunny, dog, squirrel, and chick. I like the squirrel. The others could have turned out a lot better.